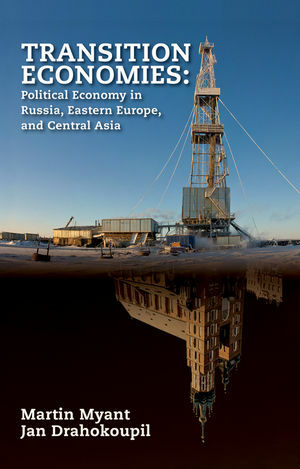 Transition Economies provides students with an up-to-date and highly comprehensive analysis of the economic transformation in former communist countries of Eastern and Central Europe and countries of the former Soviet Union. With coverage extending from the end of central planning to the capitalist varieties of the present, this text provides a comparative analysis of economic transformation and political-economic diversity that has emerged as a direct result. It covers differences between countries in terms of economic performance and integration into the world economy. Transition Economies seeks to explain and deepen understanding of these differences, chart the emerging forms of capitalism there, and provide country responses to the world financial crisis of 2008-2009. Martin Myant graduated in Economics from the University of Cambridge in 1971 and completed a PhD in modern Czechoslovak history at the University of Glasgow in 1978. He taught Economics from 1978 to 2012. His main research has been on Eastern and Central Europe, especially the former Czechoslovakia, the Czech Republic and Poland. Presents a thorough analysis of the economic and political transformations in former communist countries of Eastern and Central Europe and countries of the former Soviet Union. Provides a comparative analysis of economic transformation and emerging political economic diversity. Identifies and explains differences between groupings of countries in Eastern Europe and the former Soviet Union, and on the various forms of capitalism emerging in these countries. Explicates these economies’ responses to the world financial crisis of 2008-2009.